Governor Charlie Baker, Lt. Governor Karyn Polito and Massachusetts State Police Colonel Kerry Gilpin announced several reforms to MSP policies and procedures. The announcements come amid several scandals surrounding the State Police, including an investigation into overtime pay and an alleged police report cover-up. ELIMINATE TROOP E: Officials announced that Troop E, which patrols the Massachusetts Turnpike, will be eliminated as a stand-alone section. This comes after an audit of overtime payments to Troop E personnel. The existing Mass Pike barracks will be absorbed into other regional Troops and Troopers working out of those four barracks will be reassigned. The restructuring will allow for more supervision within each Troop. El gobernador Charlie Baker, La vicegobernador Karyn Polito y el coronel de la policía del estado de Massachusetts, Kerry Gilpin, anunciaron varias reformas a las políticas y procedimientos de MSP. ">Los anuncios se producen en medio de varios escándalos que rodean a la Policía Estatal, incluida una investigación sobre el pago de horas extras y un presunto encubrimiento del informe policial. ELIMINAR LA TROPA E: Las autoridades anunciaron que la Tropa E, que patrulla la autopista de peaje de Massachusetts, será eliminada como una sección independiente. Esto viene después de una auditoría de pagos de horas extras al personal de Troop E. El cuartel de Mass Pike existente será absorbido por otras Tropas regionales y los Troopers que trabajen desde esos cuatro cuarteles serán reasignados. La reestructuración permitirá una mayor supervisión dentro de cada Tropa. ACTIVATE AVL TECHNOLOGY: Automated Vehicle Location system, a GPS locator that is in each marked cruiser, will now be turned on in every MSP vehicle. DEVELOP BODY CAMERAS: The department is also working to develop a body camera program, which has already been piloted by the Boston Police Department. 30-DAY AUDIT OF TURNPIKE BARRACKS: Over the next 30 days, Col. Gilpin will also conduct a study of the patrols and overtime shifts worked in each Turnpike barracks. The audit will help Gilpin identify resources and figure out how many patrols need to be assigned to each barrack. 30-DAY AUDIT OF TROOP F: MSP will also look into staffing at Troop F - which is responsible for Logan Airport, Worcester Airport and Hanscom Airport, along with other Port Authority properties. The audit may show that more personnel should be assigned to Troop F to reduce the amount of overtime shifts. HIRE INDEPENDENT AUDITING FIRM: Col. Gilpin will hire an independent auditing firm to assess overtime policies, protocols and record management. STRENGTHEN STAFF INSPECTION, INTERNAL AFFAIRS: Ten new positions have been created between the department's Staff Inspections Section and Internal Affairs Section. These departments ensure all sections adhere to policies, rules and regulations, and investigates citizen complaints against the department. AUDIT OF TOP EARNERS: On a quarterly basis, MSP will audit its top 50 pay earners. These audits will be made public. UPDATED PAYROLL SYSTEM: By July 1, Troop F - which previously was paid by Massport - will now be paid directly by State Police and the department will be reimbursed by Massport. UPDATED QUESTIONNAIRES FOR RECRUITS: The department will refine and add more to the questionnaires recruit candidates are required to complete. It will also look into additional research measures for background investigators. ACTIVAR LA TECNOLOGÍA AVL: el sistema de ubicación automática del vehículo, un localizador de GPS que se encuentra en cada crucero marcado, ahora se encenderá en cada vehículo MSP.DESARROLLAR CÁMARAS CORPORALES: El departamento también está trabajando para desarrollar un programa de cámara corporal, que ya ha sido probado por el Departamento de Policía de Boston.AUDITORÍA DE 30 DÍAS DE BARRILES TURNPIKE: Durante los próximos 30 días, el coronel Gilpin también realizará un estudio de las patrullas y los turnos de horas extras trabajadas en cada cuartel de Turnpike. La auditoría ayudará a Gilpin a identificar recursos y calcular cuántas patrullas se deben asignar a cada cuartel.AUDITORÍA DE 30 DÍAS DE TROOP F: MSP también buscará personal en la Tropa F, que es responsable del Aeropuerto Logan, el Aeropuerto Worcester y el Aeropuerto Hanscom, junto con otras propiedades de la Autoridad Portuaria. La auditoría puede mostrar que se debe asignar más personal a la Tropa F para reducir la cantidad de turnos de horas extras.CONTRATACIÓN DE LA FIRMA DE AUDITORÍA INDEPENDIENTE: el Coronel Gilpin contratará a una firma de auditoría independiente para que evalúe las políticas de horas extraordinarias, los protocolos y la gestión de registros.FORTALECER LA INSPECCIÓN DEL PERSONAL, ASUNTOS INTERNOS: Se han creado diez nuevos puestos entre la Sección de Inspecciones del Personal del departamento y la Sección de Asuntos Internos. Estos departamentos aseguran que todas las secciones se adhieren a las políticas, reglas y regulaciones e investigan las quejas de los ciudadanos contra el departamento.AUDITORÍA DE LOS PRINCIPALES OPORTUNOS: trimestralmente, MSP auditará a los 50 principales contribuyentes. Estas auditorías se harán públicas.SISTEMA DE NÓMINA DE PAGO ACTUALIZADO: Antes del 1 de julio, la Tropa F, que anteriormente fue pagada por Massport, ahora será pagada directamente por la Policía Estatal y el departamento será reembolsado por Massport.CUESTIONARIOS ACTUALIZADOS PARA RECLUTAS: El departamento refinará y agregará más a los cuestionarios que los candidatos de reclutamiento deben completar. También buscará medidas adicionales de investigación para investigadores de antecedentes. Governor Charlie Baker, Lt. Governor Karyn Polito and Massachusetts State Police Colonel Kerry Gilpin announced several reforms to MSP policies and procedures. The announcements come amid several scandals surrounding the State Police, including an investigation into overtime pay and an alleged police report cover-up. ELIMINATE TROOP E: Officials announced that Troop E, which patrols the Massachusetts Turnpike, will be eliminated as a stand-alone section. This comes after an audit of overtime payments to Troop E personnel. The existing Mass Pike barracks will be absorbed into other regional Troops and Troopers working out of those four barracks will be reassigned. The restructuring will allow for more supervision within each Troop. ACTIVATE AVL TECHNOLOGY: Automated Vehicle Location system, a GPS locator that is in each marked cruiser, will now be turned on in every MSP vehicle. DEVELOP BODY CAMERAS: The department is also working to develop a body camera program, which has already been piloted by the Boston Police Department. 30-DAY AUDIT OF TURNPIKE BARRACKS: Over the next 30 days, Col. Gilpin will also conduct a study of the patrols and overtime shifts worked in each Turnpike barracks. The audit will help Gilpin identify resources and figure out how many patrols need to be assigned to each barrack. 30-DAY AUDIT OF TROOP F: MSP will also look into staffing at Troop F - which is responsible for Logan Airport, Worcester Airport and Hanscom Airport, along with other Port Authority properties. The audit may show that more personnel should be assigned to Troop F to reduce the amount of overtime shifts. HIRE INDEPENDENT AUDITING FIRM: Col. Gilpin will hire an independent auditing firm to assess overtime policies, protocols and record management. STRENGTHEN STAFF INSPECTION, INTERNAL AFFAIRS: Ten new positions have been created between the department's Staff Inspections Section and Internal Affairs Section. These departments ensure all sections adhere to policies, rules and regulations, and investigates citizen complaints against the department. AUDIT OF TOP EARNERS: On a quarterly basis, MSP will audit its top 50 pay earners. These audits will be made public. UPDATED PAYROLL SYSTEM: By July 1, Troop F - which previously was paid by Massport - will now be paid directly by State Police and the department will be reimbursed by Massport. UPDATED QUESTIONNAIRES FOR RECRUITS: The department will refine and add more to the questionnaires recruit candidates are required to complete. It will also look into additional research measures for background investigators. Definitions of Governor Charlie Baker, Lt. Governor Karyn Polito and Massachusetts State Police Colonel Kerry Gilpin announced several reforms to MSP policies and procedures. The announcements come amid several scandals surrounding the State Police, including an investigation into overtime pay and an alleged police report cover-up. ELIMINATE TROOP E: Officials announced that Troop E, which patrols the Massachusetts Turnpike, will be eliminated as a stand-alone section. This comes after an audit of overtime payments to Troop E personnel. The existing Mass Pike barracks will be absorbed into other regional Troops and Troopers working out of those four barracks will be reassigned. The restructuring will allow for more supervision within each Troop. ACTIVATE AVL TECHNOLOGY: Automated Vehicle Location system, a GPS locator that is in each marked cruiser, will now be turned on in every MSP vehicle. DEVELOP BODY CAMERAS: The department is also working to develop a body camera program, which has already been piloted by the Boston Police Department. 30-DAY AUDIT OF TURNPIKE BARRACKS: Over the next 30 days, Col. Gilpin will also conduct a study of the patrols and overtime shifts worked in each Turnpike barracks. The audit will help Gilpin identify resources and figure out how many patrols need to be assigned to each barrack. 30-DAY AUDIT OF TROOP F: MSP will also look into staffing at Troop F - which is responsible for Logan Airport, Worcester Airport and Hanscom Airport, along with other Port Authority properties. The audit may show that more personnel should be assigned to Troop F to reduce the amount of overtime shifts. HIRE INDEPENDENT AUDITING FIRM: Col. Gilpin will hire an independent auditing firm to assess overtime policies, protocols and record management. STRENGTHEN STAFF INSPECTION, INTERNAL AFFAIRS: Ten new positions have been created between the department's Staff Inspections Section and Internal Affairs Section. These departments ensure all sections adhere to policies, rules and regulations, and investigates citizen complaints against the department. AUDIT OF TOP EARNERS: On a quarterly basis, MSP will audit its top 50 pay earners. These audits will be made public. UPDATED PAYROLL SYSTEM: By July 1, Troop F - which previously was paid by Massport - will now be paid directly by State Police and the department will be reimbursed by Massport. UPDATED QUESTIONNAIRES FOR RECRUITS: The department will refine and add more to the questionnaires recruit candidates are required to complete. It will also look into additional research measures for background investigators. Synonyms of Governor Charlie Baker, Lt. 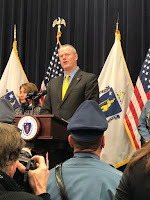 Governor Karyn Polito and Massachusetts State Police Colonel Kerry Gilpin announced several reforms to MSP policies and procedures. The announcements come amid several scandals surrounding the State Police, including an investigation into overtime pay and an alleged police report cover-up. ELIMINATE TROOP E: Officials announced that Troop E, which patrols the Massachusetts Turnpike, will be eliminated as a stand-alone section. This comes after an audit of overtime payments to Troop E personnel. The existing Mass Pike barracks will be absorbed into other regional Troops and Troopers working out of those four barracks will be reassigned. The restructuring will allow for more supervision within each Troop. ACTIVATE AVL TECHNOLOGY: Automated Vehicle Location system, a GPS locator that is in each marked cruiser, will now be turned on in every MSP vehicle. DEVELOP BODY CAMERAS: The department is also working to develop a body camera program, which has already been piloted by the Boston Police Department. 30-DAY AUDIT OF TURNPIKE BARRACKS: Over the next 30 days, Col. Gilpin will also conduct a study of the patrols and overtime shifts worked in each Turnpike barracks. The audit will help Gilpin identify resources and figure out how many patrols need to be assigned to each barrack. 30-DAY AUDIT OF TROOP F: MSP will also look into staffing at Troop F - which is responsible for Logan Airport, Worcester Airport and Hanscom Airport, along with other Port Authority properties. The audit may show that more personnel should be assigned to Troop F to reduce the amount of overtime shifts. HIRE INDEPENDENT AUDITING FIRM: Col. Gilpin will hire an independent auditing firm to assess overtime policies, protocols and record management. STRENGTHEN STAFF INSPECTION, INTERNAL AFFAIRS: Ten new positions have been created between the department's Staff Inspections Section and Internal Affairs Section. These departments ensure all sections adhere to policies, rules and regulations, and investigates citizen complaints against the department. AUDIT OF TOP EARNERS: On a quarterly basis, MSP will audit its top 50 pay earners. These audits will be made public. UPDATED PAYROLL SYSTEM: By July 1, Troop F - which previously was paid by Massport - will now be paid directly by State Police and the department will be reimbursed by Massport. UPDATED QUESTIONNAIRES FOR RECRUITS: The department will refine and add more to the questionnaires recruit candidates are required to complete. It will also look into additional research measures for background investigators. Examples of Governor Charlie Baker, Lt. Governor Karyn Polito and Massachusetts State Police Colonel Kerry Gilpin announced several reforms to MSP policies and procedures. The announcements come amid several scandals surrounding the State Police, including an investigation into overtime pay and an alleged police report cover-up. ELIMINATE TROOP E: Officials announced that Troop E, which patrols the Massachusetts Turnpike, will be eliminated as a stand-alone section. This comes after an audit of overtime payments to Troop E personnel. The existing Mass Pike barracks will be absorbed into other regional Troops and Troopers working out of those four barracks will be reassigned. The restructuring will allow for more supervision within each Troop. ACTIVATE AVL TECHNOLOGY: Automated Vehicle Location system, a GPS locator that is in each marked cruiser, will now be turned on in every MSP vehicle. DEVELOP BODY CAMERAS: The department is also working to develop a body camera program, which has already been piloted by the Boston Police Department. 30-DAY AUDIT OF TURNPIKE BARRACKS: Over the next 30 days, Col. Gilpin will also conduct a study of the patrols and overtime shifts worked in each Turnpike barracks. The audit will help Gilpin identify resources and figure out how many patrols need to be assigned to each barrack. 30-DAY AUDIT OF TROOP F: MSP will also look into staffing at Troop F - which is responsible for Logan Airport, Worcester Airport and Hanscom Airport, along with other Port Authority properties. The audit may show that more personnel should be assigned to Troop F to reduce the amount of overtime shifts. HIRE INDEPENDENT AUDITING FIRM: Col. Gilpin will hire an independent auditing firm to assess overtime policies, protocols and record management. STRENGTHEN STAFF INSPECTION, INTERNAL AFFAIRS: Ten new positions have been created between the department's Staff Inspections Section and Internal Affairs Section. These departments ensure all sections adhere to policies, rules and regulations, and investigates citizen complaints against the department. AUDIT OF TOP EARNERS: On a quarterly basis, MSP will audit its top 50 pay earners. These audits will be made public. UPDATED PAYROLL SYSTEM: By July 1, Troop F - which previously was paid by Massport - will now be paid directly by State Police and the department will be reimbursed by Massport. UPDATED QUESTIONNAIRES FOR RECRUITS: The department will refine and add more to the questionnaires recruit candidates are required to complete. It will also look into additional research measures for background investigators. Translations of Governor Charlie Baker, Lt. Governor Karyn Polito and Massachusetts State Police Colonel Kerry Gilpin announced several reforms to MSP policies and procedures. The announcements come amid several scandals surrounding the State Police, including an investigation into overtime pay and an alleged police report cover-up. ELIMINATE TROOP E: Officials announced that Troop E, which patrols the Massachusetts Turnpike, will be eliminated as a stand-alone section. This comes after an audit of overtime payments to Troop E personnel. The existing Mass Pike barracks will be absorbed into other regional Troops and Troopers working out of those four barracks will be reassigned. The restructuring will allow for more supervision within each Troop. ACTIVATE AVL TECHNOLOGY: Automated Vehicle Location system, a GPS locator that is in each marked cruiser, will now be turned on in every MSP vehicle. DEVELOP BODY CAMERAS: The department is also working to develop a body camera program, which has already been piloted by the Boston Police Department. 30-DAY AUDIT OF TURNPIKE BARRACKS: Over the next 30 days, Col. Gilpin will also conduct a study of the patrols and overtime shifts worked in each Turnpike barracks. The audit will help Gilpin identify resources and figure out how many patrols need to be assigned to each barrack. 30-DAY AUDIT OF TROOP F: MSP will also look into staffing at Troop F - which is responsible for Logan Airport, Worcester Airport and Hanscom Airport, along with other Port Authority properties. The audit may show that more personnel should be assigned to Troop F to reduce the amount of overtime shifts. HIRE INDEPENDENT AUDITING FIRM: Col. Gilpin will hire an independent auditing firm to assess overtime policies, protocols and record management. STRENGTHEN STAFF INSPECTION, INTERNAL AFFAIRS: Ten new positions have been created between the department's Staff Inspections Section and Internal Affairs Section. These departments ensure all sections adhere to policies, rules and regulations, and investigates citizen complaints against the department. AUDIT OF TOP EARNERS: On a quarterly basis, MSP will audit its top 50 pay earners. These audits will be made public. UPDATED PAYROLL SYSTEM: By July 1, Troop F - which previously was paid by Massport - will now be paid directly by State Police and the department will be reimbursed by Massport. UPDATED QUESTIONNAIRES FOR RECRUITS: The department will refine and add more to the questionnaires recruit candidates are required to complete. It will also look into additional research measures for background investigators.